I hate to do fly-by posts, but time is flying! I again have stacks of essays surrounding me that I *really* need to finish grading. Somehow this semester seems like it's on caffeine and adrenalin...on overdrive. Semesters are usually hectic, but this one seemed to escalate early and stay revved up. I have to admit I'm looking forward to a couple of days of Fall Break in a few weeks...just to slow the pace down a little tiny bit. Oh, but enough about all that...I have news! 1) The Get Lost in a Story blog invited me to do an interview. My online writer friend and BookEnds agency sister Lara Lacombe, whose debut romantic suspense DEADLY CONTACT will be released by Harlequin in November, asked me all sorts of fun questions! 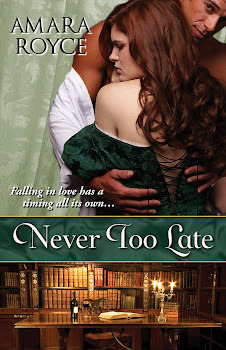 And there's a giveaway of NEVER TOO LATE! Come visit!